Beneath a video image of Justice Stephen G. Breyer, Norah O’Donnell questions the jurist. Justice Stephen G. Breyer knows the game. Without looking, Breyer knew exactly where he stood Thursday night throughout a 90-minute chat with CBS reporter Norah O’Donnell on the Bushnell stage, how close he was to boundaries beyond which a justice of the U.S. Supreme Court should not venture. 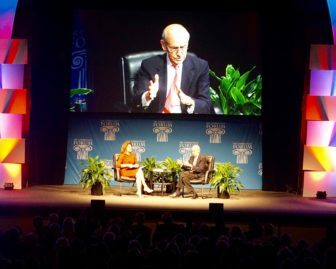 Instead, the 79-year-old Breyer charmed and parried before a Connecticut Forum audience of 2,800. He quoted Cicero’s warning — in Latin — about the limits of law in times of war. Asked to define a “constitutional crisis,” he talked about a boisterous president who defied the courts. It was Andrew Jackson, who ignored a Supreme Court ruling in 1830 against the forced relocation of Indians from the southeastern U.S.
“I’d say that was unfortunate,” Breyer said. Trump’s name never came up, not directly. There were questions about civil discourse in a time of rancor. And one question submitted from the audience briefly stilled the concert hall, which stands across from the State Capitol and Connecticut Supreme Court in Hartford. “Is our Constitution strong enough to prevent an authoritarian form of government?” O’Donnell asked, reading from an index card. “I certainly hope so,” Breyer said, his voice even. 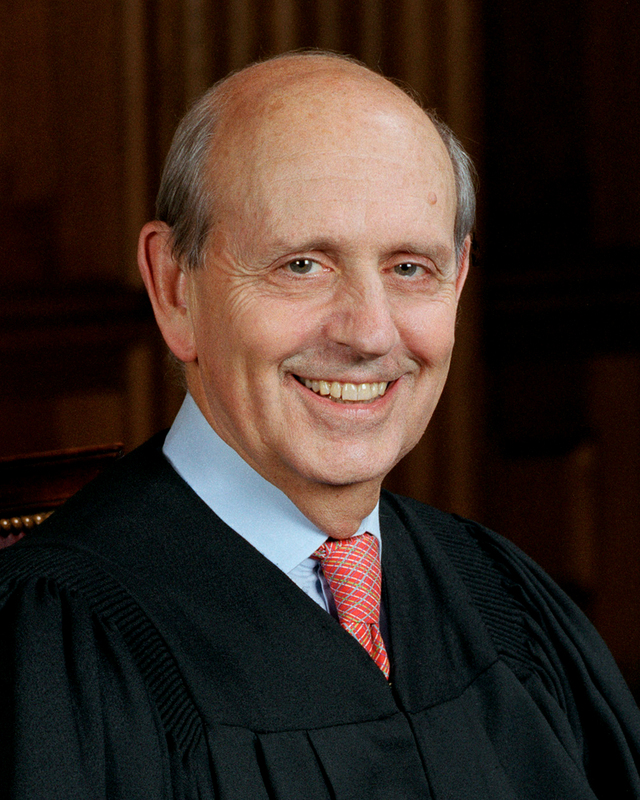 Breyer, a Harvard law professor appointed to the U.S. Court of Appeals by Jimmy Carter in 1980 and to the Supreme Court by Bill Clinton in 1994, fondly recalled serving as the chief counsel of the U.S. Senate Judiciary Committee under U.S. Sen. Ted Kennedy, whose son and namesake, state Sen. Ted Kennedy Jr., was in the audience. Kennedy, he said, was a master at reaching across the aisle, winning over Republicans by incorporating their ideas and lavishly sharing credit. Smiling, Breyer said Kennedy used the sharing of credit as a benign and effective political weapon. He smiled, knowing he was describing a Washington that no longer exists. Breyer took pains to emphasize the lack of enmity in a sharply divided court, where the disagreements are intellectual, not personal. Breyer often is described as a pragmatist and centrist, bumped to the left by the court’s conservative turn. With Ginsburg, Elena Kagan and Sonia Sotomayor, Breyer is a member of the court’s reliable liberal bloc, particularly on social issues, such as gay marriage. He was asked about the 5-4 decision legalizing gay marriage. It was written by Justice Anthony Kennedy and supported by Breyer. “Well, we decided gay marriage was constitutionally required,” Breyer said. But he said nothing more about the decision. Kennedy, a pivotal figure on the court as a frequent swing vote, is 81. O’Donnell didn’t ask if Breyer, Ginsburg or Kennedy intend to delay their retirements until after the next presidential election. Instead, she asked if there should be an age limit on justices of the Supreme Court. “I wouldn’t have to think about it, would I?” he replied, laughing. His is one of the court’s strongest voices in opposition to the death penalty. To know why, he referred his audience to a sweeping dissent he wrote in 2015 urging the court to re-examine the constitutionality of the punishment. He genially warned it was 46 pages. An audience member wanted to know if the First Amendment was under attack. He smiled. The audience applauded, even if Breyer had only implied an opinion, not given one. A more direct question from O’Donnell was rebuffed. She asked about the NFL players who are kneeling during the national anthem, a protest against racial injustice. Breyer is one of the court’s strongest defenders of a woman’s right to an abortion. “Are you a feminist?” O’Donnell asked. “I don’t know what that is,” Breyer replied. O’Donnell paused, giving Breyer a chance to say more. He didn’t. “O-K,” the newswoman said, drawing out the two syllables. Breyer, who said earlier that silence was a weapon to be wielded in conversation and during interviews, said nothing more. Careful as he was, Breyer said his former colleague, Sandra Day O’Connor convinced him long ago about the importance of being available, of being willing to demystify the court in public appearances. He agreed, even if he said he opposes opening the court to television.